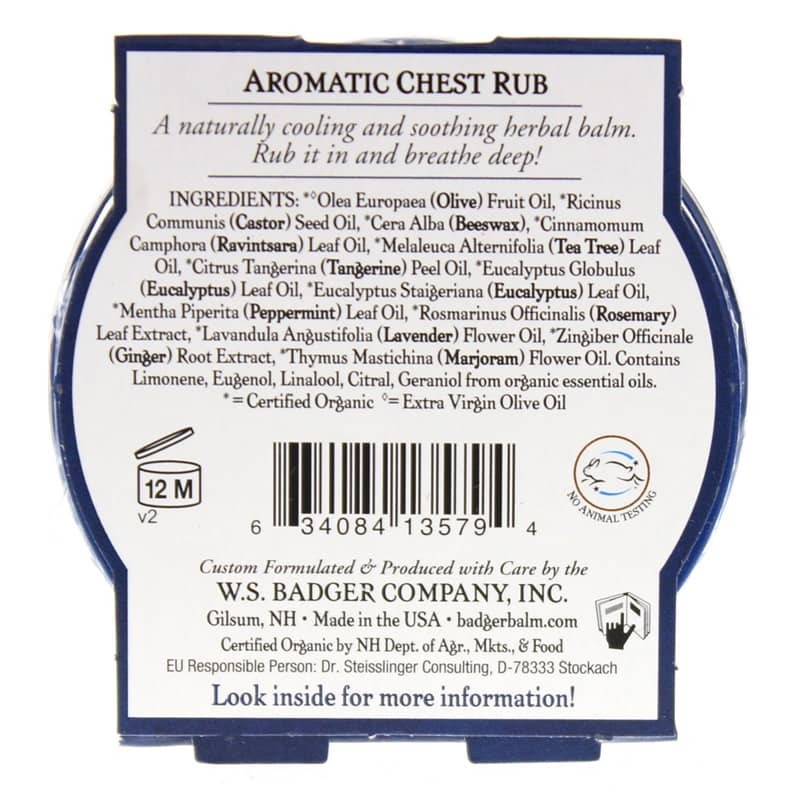 Aromatic Chest Rub with Eucalyptus and Mint from Badger is an all-natural, Certified Organic balm with eucalyptus and other soothing and cooling herbs that may support deep breathing and relaxation. Ships tomorrow if you order in the next 17 hours 15 minutes. 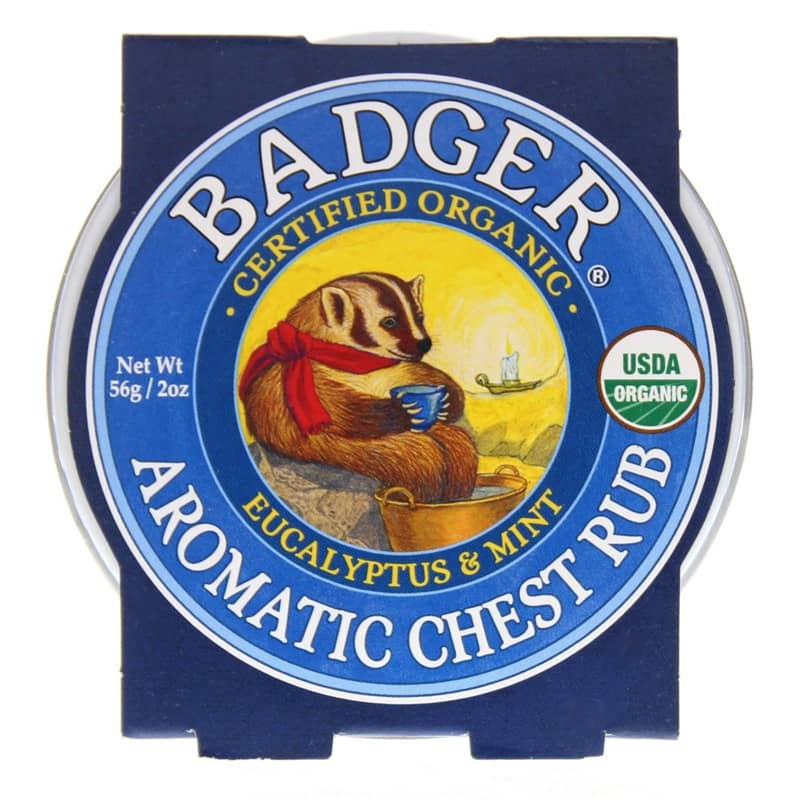 Created especially for one of Badger's own family members, Aromatic Chest Rub is the perfect, all-natural way to breathe - and feel - better. Suitable for the whole family, you'll want to make it a part of your family care kit when dealing with seasonal symptoms like congestion and coughs. A base of Certified Organic extra virgin olive oil, castor oil and beeswax makes it wonderful for rubbing directly on the chest, but the balm can also be added to a humidifier or hot water and used as a steam inhalant. Take a deep breath and order today! *Olea Europaea (Olive) Fruit Oil**, *Ricinus Communis (Castor) Seed Oil, *Cera Alba (Beeswax), *Eucalyptus Globulus (Eucalyptus) Leaf Oil, *Eucalyptus Staigeriana (Eucalyptus) Leaf Oil, *Lavandula Angustifolia (Lavender) Flower Oil, *Mentha Piperita (Peppermint) Leaf Oil, *Cinnamomum Camphora (Ravintsara) Leaf Oil, *Citrus Tangerina (Tangerine) Peel Oil, *Melaleuca Alternifolia (Tea Tree) Leaf Oil, *Thymus Mastichina (Wild Marjoram) Leaf Oil, *Zingiber Officinale (Ginger) Root Extract *Rosmarinus Officinalis (Rosemary) Leaf Extract. Organic essential oils contain >0.001% Limonene, Eugenol, Linalool, Citral and Geraniol.